After an auto-upgrade Firefox quantum to 66.0, scrolling sites with arrows keys (up / down) not working properly, scroll jumps to a paragraph of the webpage and select texts box and so on. I can't scroll smoothly. You can enable/disable smooth scrolling & go back to the old behavior in Preferences > Type "scrolling" in "find in preferences" box. There you may find the desired Scrolling options. Not the answer you're looking for? Browse other questions tagged keyboard xubuntu firefox scrolling . 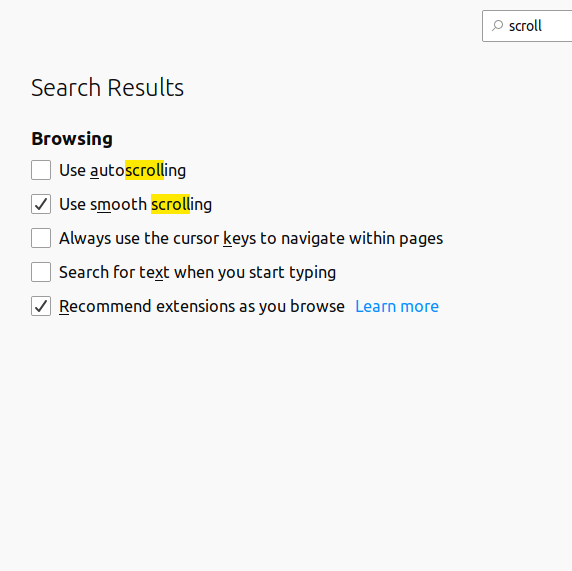 How to enable scrolling with arrow keys?